Bin’s young career perfectly fits the criteria required for this prize. He completed his PhD in Zhejiang University, China under the direction of Prof. Ming Zhang in June, 2013. 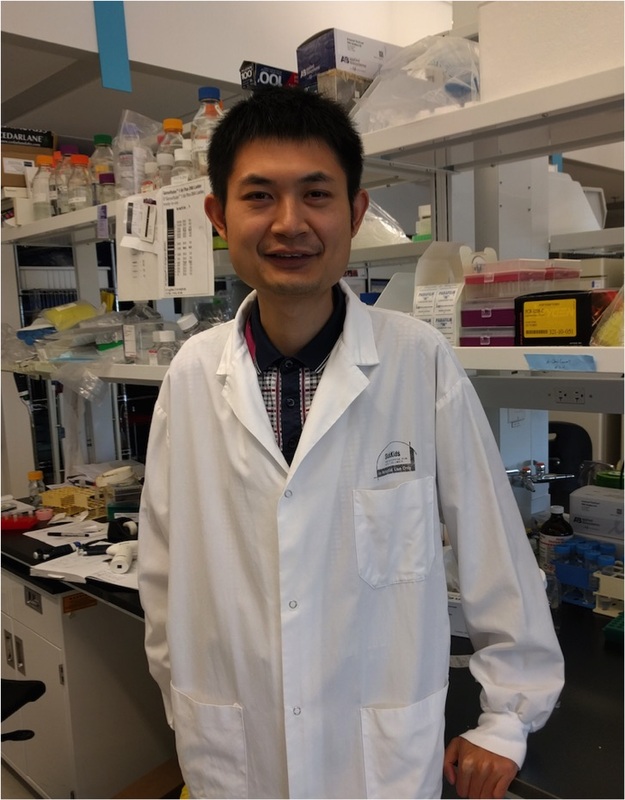 During his PhD program, he became interested in whether the Aire protein, which activates promiscuous gene expression in thymic medullary epithelial cells, might also play a role in promoting the permissive expression profile and pluripotency in embryonic stem cells. He published several papers on the function of Aire in stem cells during this time. He was also clearly a lab leader in his group in China and was involved in many other projects, including several that led to the generation of a start-up company in China, where he still has an advisory capacity. The seeds of future success were already apparent—this was a young investigator with passion, entrepreneurial talent, creativity and drive. Bin joined Janet Rossant’s lab in 2013, where he started to use BioID analysis and super-resolution microscopy to show that Aire associates with spindle proteins in mouse embryonic stem (ES) cells. Using CRISPR-Cas9 in mouse zygotes, he generated a floxed allele of Aire and was able to show that inducible depletion of Aire in ES cells did not disrupt pluripotency per se, but did cause defects in centrosome number regulation and spindle pole integrity. Using the same allele in mouse embryos, he showed that maternal/zygotic depletion of Aire caused mitotic irregularities in the early embryo, but that most embryos were able to recover (presumably when normal centrosomes are formed independent of Aire after implantation) and complete development. These effects of Aire are specific to ES cells and the early embryo and suggest that the cell biology of mitotic control in the early embryo has some distinct characteristics that need to be better understood. This comprehensive study was published last year in eLife. These findings led Bin to his current biological interest in the special transcriptional and chromatin events that occur at transitions from maternal transcription during oogenesis, to zygotic genome activation, when there is a high degree of hyper-transcription in the embryo, to the re-establishment of ordered transcriptional control and lineage specification. In an effort to develop new tools that would allow him to visualize transcriptional events at the single molecule level in real time in the mouse embryo and also to be able to disrupt gene function in very precise time windows during the process of maternal to zygotic gene transcription, he worked closely with another post-doc in the lab, Eszter Poszfai, to establish 2C-HR-CRISPR. This method extends the power of CRISPR-Cas9 by allowing efficient homologous recombination of large insertions, such as fluorescent reporters, in mouse embryos. With the 2C-HR-CRISPR approach that has dramatically increased the efficiency of generating reporter lines by homologous recombination, Bin and Eszter Poszfai were able to target over 20 genes with reporters, degrons and other inserts. Bin added an additional enhancement using a biotinylated repair donor with a Cas9-monomeric streptavidin (Cas9-mSA) fusion protein, which increased the efficiency of recombination even further- up to almost 100% in some cases. He also showed proof of principle that the auxin degron system (AID) can be used to achieve temporally sensitive and reversible perturbation of function at the protein level in early embryos. This is another exciting advance that opens up new ways of studying gene function in very precise windows in development (published in Nature Biotechnology this year). With these technologies in hand, Bin has launched an exciting series of experiments to explore the transcriptional events of ZGA in unprecedented detail using high resolution imaging with Halo-tagged proteins, sensitive perturbation of function at the protein level, using the auxin degron system (AID), combined with single cell genomics. As stated by Janet Rossant, who enthusiastically supported his nomination for this award: “Bin has not finished with technology development. The whole CRISPR transgenic field is moving very fast and there will clearly be a variety of modifications to the basic 2C-HR-CRISPR approach that will take mouse transgenesis to new levels. Bin is very aware of the developments in the field and I am sure he will come up with new and creative modifications in the future. He is also in contact with and providing advice to several groups who want to try this approach in other species including non-human primates”. We are most pleased that Bin has agreed to receive the ISTT Young Investigator Award, thus joining the list of previously honored scientists, including Alexis Komor (2017), Pablo Ross (2016), Feng Zhang (2014), Toru Takeo (2013) and Xiao-Yang Zhao (2011). He will attend the next 15th Transgenic Technology meeting (TT2019) in Kobe (Japan, April 7-10, 2019) where he will receive the corresponding diploma and will deliver a talk summarizing his scientific achievements, giving us a unique opportunity to learn more about recent advances in the field. The following articles represent some of his recent findings published in the last years, highlighting his most recent contributions to the field. These publications have had a substantial impact in the animal transgenesis field and have rapidly become highly sought-after references for subsequent studies. Gu B., Posfai E. and Rossant J. Efficient generation of targeted large insertions by microinjection into two-cell-stage mouse embryos. Nat Biotechnol 36, 632-637, doi:10.1038/nbt.4166 (2018). Gu, B., Lambert, J. P., Cockburn, K., Gingras, A. C. & Rossant, J. AIRE is a critical spindle associated protein in embryonic stem cells. Elife 6, doi:10.7554/eLife.28131 (2017). of embryonic stem cells through Lin28. Stem Cells Dev 21, 2878-2890, doi:10.1089/scd.2012.0097 (2012). Gu B, Zhang J, Chen Q, Tao B, Wang W, Zhou Y, Chen L, Liu Y, Zhang M. Aire regulates the expression of differentiation-associated genes and self-renewal of embryonic stem cells. Biochem Biophys Res Commun 394, 418-423, doi:10.1016/j.bbrc.2010.03.042 (2010). Gu B, Zhang J, Wu Y, Zhang X, Tan Z, Lin Y, Huang X, Chen L, Yao K, Proteomic analyses reveal common promiscuous patterns of cell surface proteins on human embryonic stem cells and sperms. PLoS One 6, e19386, doi:10.1371/journal.pone.0019386 (2011). Gu B, Zhang J, Wang W, Mo L, Zhou Y, Chen L, Liu Y, Zhang M. Global expression of cell surface proteins in embryonic stem cells. PLoS One 5, e15795, doi:10.1371/journal.pone.0015795 (2010). The TT2019 ISTT Young Investigator Committee: Jan Parker-Thornburg (BoD member and previous ISTT President) , Ernst-Martin Füchtbauer (BoD Officer) and Benoît Kanzler (ISTT Vice-President). 0 comments on "Bin Gu, PhD, selected as 6th ISTT Young Investigator"